Dark chocolate cake mix made with strong coffee, mixed with coffee icing and covered with dark chocolate. These should help you perk up in the morning! These were delicious, but I wondered if maybe there was a little too much icing. I used 1 1/2 cups, and will probably try them with just 1 cup of icing next time, and add a little more icing if needed. 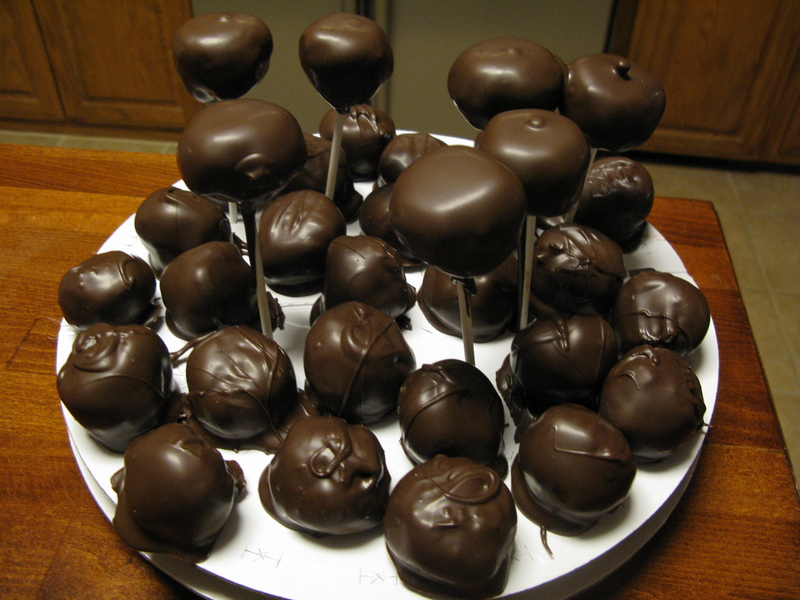 What I learned: I originally was going to do an entire batch of cake pops, but got a little frustrated with the pops stand. The first time I made pops, I used a styrofoam board…and will be using that from now on. The pops stand may look better, but when you have chocolate dripping down from trying to push the lollipop stick down into the slots, it gets messy. It also takes extra time, because I had to push through each hole before I put the pop in it to dry. The styrofoam board works really well with using pops, I highly recommend it!